Australia is an amazing place filled with beautiful beaches, spectacular rainforests, iconic landmarks, and unique wildlife. It’s not surprising that so many people want to come and visit. Every year, tens of thousands of backpackers arrive in Australia with a working holiday visa and a plan to see as much of this great country as possible. There is one problem that most of them have though…Australia is expensive! Compared to other backpacker favourites like SE Asia, India and Latin America, the cost of travelling in Australia is through the roof. A dorm bed, which can cost as little as $4 per night in other parts of the world, can cost up to $60 a night in Australia. Travel between cities is also far more expensive, and let’s not even get started on the price of a beer. Fortunately, work in Australia pays well and there is plenty of it. 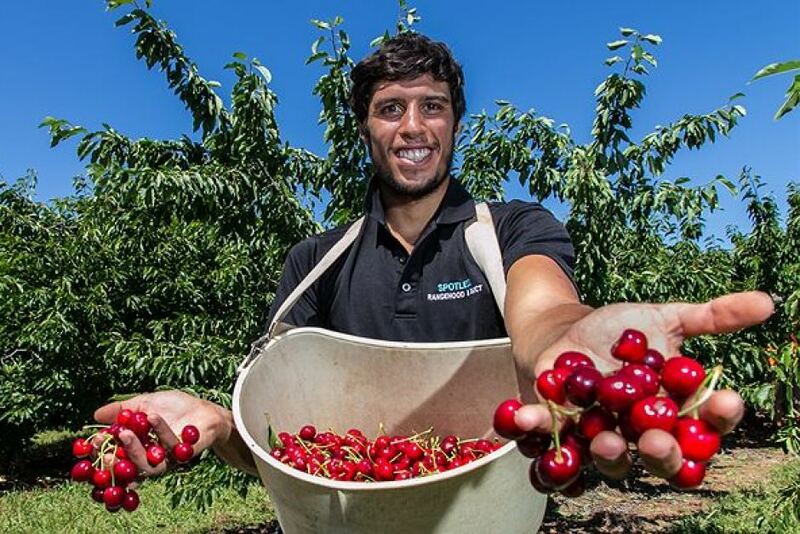 If you want to improve your tan you can earn $20 an hour picking fruit in the countryside. If you prefer the comfort of the A.C. you can pick up office work that can pay $25 an hour or more. The only problem with these high-paying jobs is that…they are jobs! You’re not supposed to be working you’re supposed to be travelling! Maybe you’ve heard about matched betting before. After all, it is hugely popular in the UK, where a quarter of working holiday visa holders come from. In fact, you might even know someone who paid for their flights to Australia by matched betting. Matched betting is a technique that allows users to profit from bookmaker sign-up bonuses in a completely risk-free way. They do this by betting on all possible outcomes so that they can never lose. It’s completely legal and is a fantastic way to make a lot of money in a short space of time. For more information I recommend reading this article in the Guardian newspaper, or checking out the matched betting wikipedia page. The great news for backpackers is that matched betting in Australia is even more profitable than it is in the UK. There are more than $5000 worth of sign-up bonuses available from Australian bookmakers. They also offer regular promotions that can earn matched bettors hundreds of dollars every week. The only thing that has been missing, until now, is a service that makes the whole process easy. Our range of tutorials start with the basics and walk you through how to profit from your first bonus. They then continue to show you more and more advanced techniques that will allow you to earn even more money. 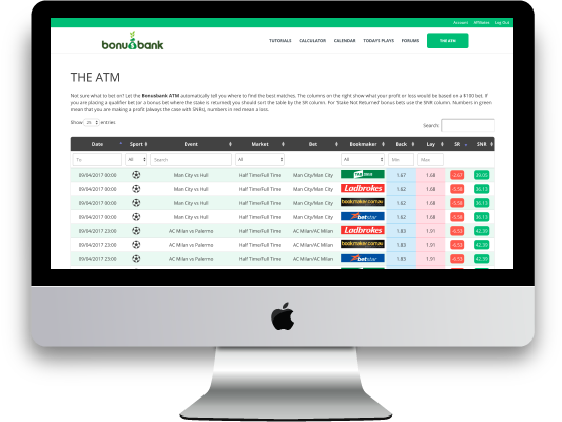 We also have a range of tools like our matched betting calculator and the bonusbank ATM, the original and best matched betting software in Australia. The ATM constantly scans Australian bookmakers so that you don’t have to. It saves you time and allows you to withdraw the greatest amount of cash from each bonus bet. On top of all of that, we also highlight the best matched betting opportunities each day in our ‘Today’s Plays‘ section. These low-risk, high-value bets take only a few minutes to place each day and average our members over $100 profit every week. There really is no better way to top up your travel fund than with matched betting. With just a few hours work each week you can make thousands of dollars. Not only that but you can do it from anywhere in the country. You can even do it on the bus as you travel from place to place. Why not give it a go with a Free bonusbank account that will teach you the basics and show you how to make up to $100 from your first bookie bonus. There is no need to enter any credit card details or make a long-term commitment. Just try it for free and then upgrade to a Premium account once you have made your first profits. If you’re still not sure, why not read our frequently asked questions or get in touch. We’ll be happy to help you on your way to the best backpacker job in Australia! Can someone on no-work holiday visa do this too? Is that legal? Anyone in Australia who has an Australian bank account can do this. Bookmakers require that you verify your accounts by providing certified copies of your passport and bank account. As long as you can provide those things you won’t have a problem. How do u send proff of residence if u dont actualy live in australia but are just a backpacker for a month. The most common way to prove your address is with a bank statement from an Australian bank. Most longer-term backpackers will open one of these so that they can paid for any work they do. If you are only going for a month you may have some difficulty. It is also necessary to have you bank statement verified by a Justice of the Peace or at a Post Office. It sounds too good to be true, how do we know it’s not another scam? Hi Sab. That is a reasonable concern and one that a lot of people have. For an independent review of whether matched betting actually works i suggest reading this article in the guardian, or this one in the telegraph. You can also just google ‘matched betting’ and you will find hundreds of websites and thousands of people discussing their own experiences making money this way. You can also just sign up to our free account and start reading through the tutorials. We don’t ask for any money or payment details. All of the info that you need to get started is there for free. Once you have tried it for yourself and seen that it works you can upgrade to Premium. There is no need to know anything about sports or betting. Our software shows you what to bet on, and as long as you follow the instructions carefully you will always make a profit. Most of the bookies have apps so a phone is okay, but an iPad or laptop does make things easier as you will usually have a few tabs open at any time.